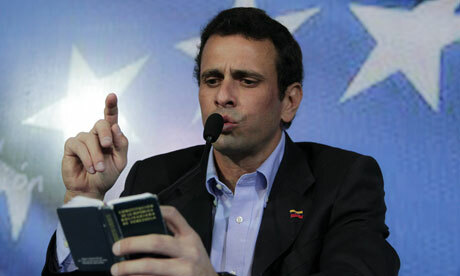 Henrique Capriles reading a rare copy of the constitution that hasn’t had article 328 excised yet. Our understanding is that, as of today, the opposition has genuinely not yet decided whether to participate in upcoming elections. Yesterday’s snap judgment from the Supreme Tribunal allowing Maduro to be sworn in as president and to retain the office during the campaign, together with the Defense Minister’s astonishing vow to effectively turn the military into Candidate Maduro’s campaign ground-game machine have put the MUD’s participation into serious doubt. When both the guys with the gowns and the guys with the guns are openly, unembarrassedly lined-up behind the incumbent and vowing to eliminate you, it’s hard to convince even the most die-hard comeflor to take part. A final decision has not yet been made. It’s telling that this is even a question. Henrique Capriles, Primero Justicia and the current MUD leadership have long been the standard-bearers of the opposition’s participationist camp. In some ways, their determination to participate in campaigns even when they could see conditions were not really fair was the defining feature of their political position, the thing that set them apart from the other main camp, the abstentionists. That even these guys are thinking twice about taking part tells its own story about the gravity of the political moment.